DOVER-FOXCROFT — Join us for a morning bird walk at 8 a.m. Saturday, May 12, at the Law Farm, 22 Lee Cemetery Road. Piscataquis County Soil & Water Conservation District will host birding expert, Bob Duchesne to view year-round birds in Maine and also some returning springtime birds. Bring your binoculars and cameras, wear your mud boots or other sturdy weather-proof footwear, and join us as we hike out to the wetland observation deck and explore the beautiful one mile nature trail, the Looping Trail, all while we experience the joys of birds and their habitat at the Law Farm. The Looping Trail winds through the edge of open fields, softwoods, mixed hardwoods and the edge of a wetland. The Law Farm’s extensive wetlands with natural biodiversity offer ideal habitat for birds. We may discover, see and hear hermit thrushes, winter wrens, eastern phoebes, yellow-rumped warblers, pine warblers, palm warblers, yellow-bellied sapsuckers, and broad-winged hawks, in addition to chickadees, nuthatches, and woodpeckers as we traverse the fields, woodlands and wetland at the Law Farm. 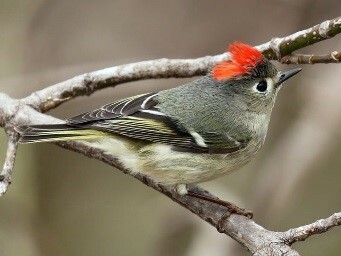 Last year we were lucky enough to see a Merlin that stayed in view for a long time and a ruby crowned kinglet. Bob Duchesne became interested in birds in the first grade. Interest grew to passion, and today Bob is one of Maine’s top birding experts. He is Vice President of Audubon’s Penobscot Valley Chapter in the Bangor area. Bob is a frequent tour leader and has led trips from Atlantic Canada to the Florida Everglades. In 2009, Bob completed development of the Maine Birding Trail and has authored a guidebook for the state, published on Down East Books, which the PCSWCD’s Demonstration Forest is listed in. He currently writes a weekly birding column for the Bangor Daily News. Bob recently began a sixth term as a member of the Maine House of Representatives, where he serves on the Environment and Natural Resources Committee and helps direct state environmental policy. Since the Law Farm land was deeded to the District in 2009, the PCSWCD has developed a trail system and created an engaging outdoor space for Piscataquis County residents and visitors to enjoy and actively learn about the benefits of a community forest. The Law Farm Bird Walk is a great way for folks to enjoy what the Law Farm has to offer as an outdoor educational and recreational space, while learning first-hand from Maine’s Birding Expert Bob Duchesne. At the end of the workshop, one participant’s name will be drawn for a bluebird house to help foster their at-home bird watching. We hope you join us for this FREE family friendly outdoor event! Donations to the PCSWCD are also greatly appreciated. The Piscataquis County Soil and Water Conservation District encourages everyone interested in coming to the bird walk to RSVP by May 9th by calling our office at (207) 564-2321 extension 3 or emailing us at info@piscataquisswcd.org.